The largest CPV deployment in the world used solar module hardware from Amonix. A 30-megawatt solar project changing hands is no longer headline news in today's solar industry, or at GTM. But, when that project is the 30-megawatt Alamosa project -- a power plant that happens to be the world's largest operating concentrated photovoltaic (CPV) installation -- that calls for a mention. Korea Electric Power Corp (Kepco) is going to acquire the PV power plant from Carlyle Group‘s Cogentrix Solar Holdings, according to a statement from the utility, in its first move into the American energy industry. The deal was estimated at $34 million by the The Korea Economic Daily. Cho Hwan-ik, president of Kepco, said, "I am glad to secure a beachhead to move into the U.S. power market. We will keep looking for power generation assets for acquisition including wind power, solar, and other renewable energy plants." He explained in a release, "In accordance with the Paris Climate Change deal, Korea must reduce greenhouse gas emissions by 37 percent by 2030. The best way to do this is acquiring renewable energy power plants overseas." Inverters for the facility are from Solectria. According to an article in Power, "The plant can provide large amounts of reactive power, closed-loop power factor control, as well as AC voltage regulation. Moreover, the controller can throttle the site's solar energy output to help regulate the grid frequency, when needed." CPV is a troubled solar sub-market with roughly 100 megawatts deployed and $500 million invested over the last 10 years, compared to the tens of billions received by the silicon industry. China's Suncore is still in the CPV business. Amonix had to shut down its Las Vegas production facility in 2012 and has rechristened itself as Arzon Solar, with Amonix founder Vahan Garboushian as CEO. Soitec left the CPV business in 2015. SolFocus shut down in 2013. GreenVolts went out of business in 2012. JDSU quietly exited the CPV cell market after acquiring QuantaSol. Energy Innovations, Soliant, Concentrator Optics, SunPower's C7 and Skyline Solar's low-concentration PV (LCPV) have all passed on. Cogenra moved from LCPV-plus-heat to a solar cell mounting business that got bought by SunPower. Solaria is still building or licensing LCPV and solar windows. Early-stage startups such as Morgan Solar, REhnu and Semprius still believe that CPV's economic riddle can be solved. 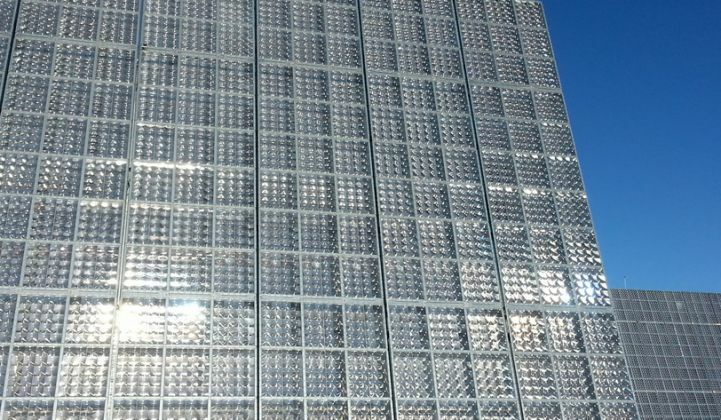 Former Solar Junction CEO Vijit Sabnis told GTM in a previous interview that no other PV technology has the headroom to improve its efficiency like multi-junction solar cells. Sabnis said he saw 50 percent cell efficiency as achievable in a few years -- which could get DC module efficiencies to greater than 40 percent.